Visit the Nature Center and host a celebration here! 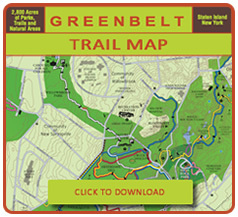 The centrally-located Greenbelt Nature Center – 700 Rockland Avenue near Brielle Avenue – is a hub for a wide range of Greenbelt activities and programs. Here you may view the Richmond County Savings Foundation exhibits to learn about Greenbelt history, geography, flora and fauna, and current happenings. Please enjoy our newly installed “Flexi-pave” walkways made from recycled materials, and also made possible with funding from the Richmond County Savings Foundation. “Into the Outdoors” public programs includes a range of programs including art workshops, author lectures, performances, and hikes throughout the year. Mini Camp, Peepers, and Tree Tots are programs for our youngest naturalists; “Nature of Art” workshops are offered for teens, adults, and seniors. Environmental education classes take place at the Nature Center as well. The Center is ADA compliant and presents many accessible programs. Click here for a complete calendar of events. 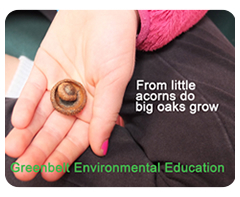 Please feel free to contact our staff at (718) 351-3450 or e-mail naturecenter@sigreenbelt.org for inquiries. 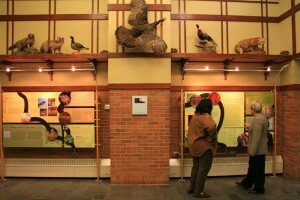 The Nature Center with its Richmond County Savings Foundation exhibits opened in 2004 and has since introduced more than a hundred thousand visitors to the Greenbelt. The building sits in harmony with its natural surroundings and offers views of Greenbelt woodlands from every vantage point. Enter through an decorative iron gate with a tree motif to discover the Greenbelt and all that it offers. Hiking trails such as the Nature Center loop trail, and the Blue and White trails are easily accessible from the Center’s grounds. 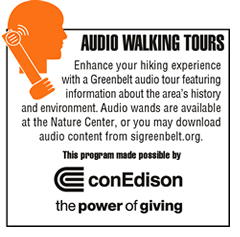 The “E trail,” a short extension to the Nature Center trail, is a destination for Greenbelt educators and their students. The building’s “green” features include wide overhangs to keep the building cool in summer, a compost bin (we are a NYC Compost Demonstration site), a rain barrel for harvesting rainwater for flowering annuals and native species landscaping, which requires little or no additional watering. The Nature Center is available to rent for a family celebration or corporate gathering. Please contact our Rental Coordinator who may be reached at (718) 667-2165, ext. 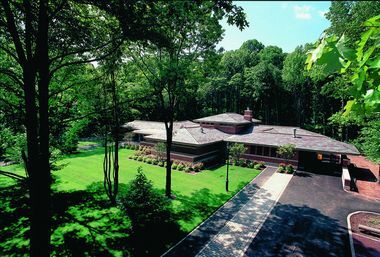 323 or by email: celebrate@sigreenbelt.org to make arrangements or visit the Nature Center to discuss rental options. Extended hours during special programs.